These conferences bring together renowned personalities of traditional architecture for two days, along with an audience made up of students, professors and other professionals, always generating interesting debates and exchanges of information. Select one of the images to see videos of all the conferences that have been recorded and download the publication that is edited to the same effect. These conferences were held from May 8 to 10, 2018 at the Institute of Cultural Heritage of Spain (IPCE) and were organized by the IPCE itself , with the collaboration of Richard H. Driehaus Charitable Lead Trust and INTBAU. The Reconstruction of Cultural Heritage International Seminar. 2018. The Reconstruction of Cultural Heritage International Seminar has been organized by INTBAU and the Rafael Manzano Prize for New Traditional Architecture, thanks to the support of the Richard H. Driehaus Charitable Lead Trust, through a grant from the Chicago Community Foundation for the Richard H. Driehaus Charitable Fund, and the collaboration of the EKABA Foundation, the Fundação Serra Henriques, Universidad Politécnica de Madrid, the Escola Superior Gallaecia, the Universidad Alfonso X el Sabio, and the Centro de Investigación de Arquitectura Tradicional (CIAT-UPM), and it celebrates the European Year of Cultural Heritage. The record and digital edition of these conferences, which can be visited through the links, has been made by the audiovisual services team of the School of Architecture of the Universidad Politécnica de Madrid. Architecture and Place Making International Seminar. 2017. The Architecture and Place Making International Seminar was organized by INTBAU (International Network for Traditional Building, Architecture and Urbanism) and the Rafael Manzano Prize for New Traditional Architecture, thanks to the support of the Richard H. Driehaus Charitable Lead Trust, through a grant from the Chicago Community Foundation for the Richard H. Driehaus Charitable Fund, and the collaboration of the Universidad Politécnica de Madrid, the Escola Superior Gallaecia, the Universidad Alfonso X el Sabio, the Fundação Serra Henriques and the Centro de Investigación de Arquitectura Tradicional (CIAT-UPM). 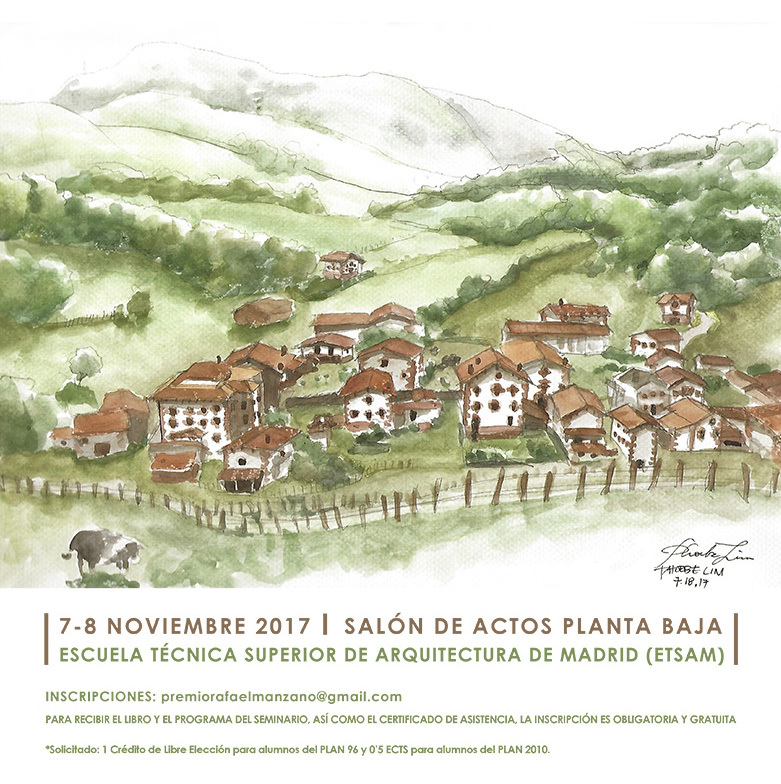 It was held on 7, 8 November 2017 at the Universidad Politécnica de Madrid School of Architecture. Mieke Bosse: Where does a city live? Architecture and Traditional Building Crafts International Seminar. 2016. During it were presented a wide variety of proposals, reflections, initiatives and programmes that have developed or are developed around the architecture and traditional building trades craftsof construction. Thus, bringing together all of this in their contribution to the preservation and promotion of this intangible heritage, updating it, adapting it to contemporary needs, and above all, providing continuity to the application and transmission of a category of knowledge that constitutes an irreplaceable source of proven sustainable solutions in which to inhabit our environment. The Architecture and Traditional Building Crafts International Seminar was organized, thanks to the support of the Richard H. Driehaus Charitable Lead Trust, by the Rafael Manzano Prize for New Traditional Architecture and the Notre Dame University School of Architecture (Indiana, EEUU), with the participation of the Universidad Politécnica de Madrid School of Architecture, the Universidad Alfonso X el Sabio and the collaboration of the Centro de Investigación de Arquitectura Tradicional (CIAT) and INTBAU Spain. It took place in 20-21 October 2016 in the Universidad Politécnica de Madrid School of Architecture (ETSAM). 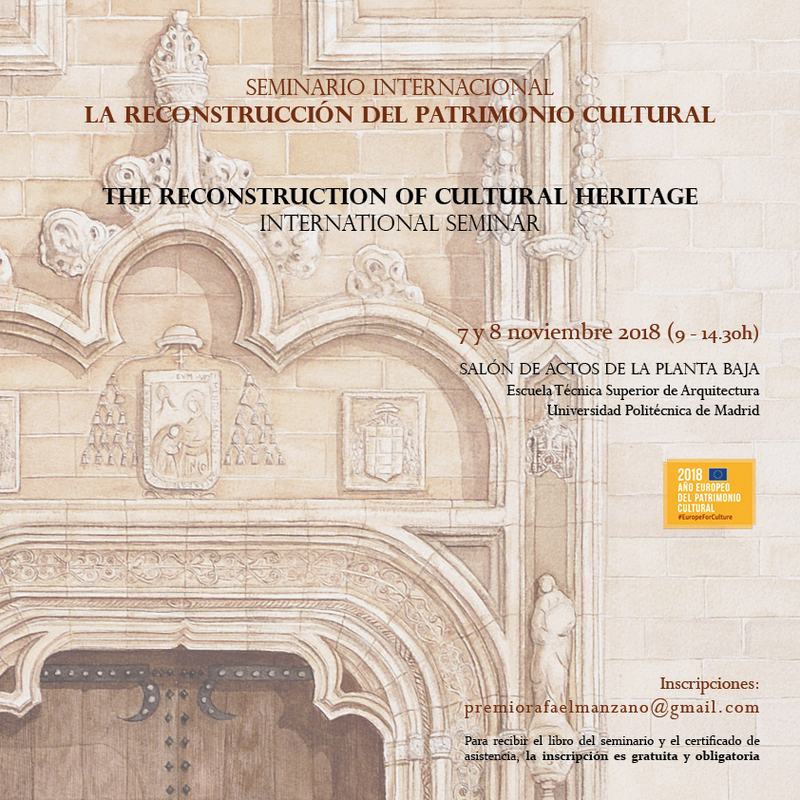 On the first day, Rafael Manzano lectured about his reconstruction work on the monastery of San Pelayo de Cerrato in Cevico Navero, Palencia; Enrique Nuere (Rafael Manzano Prize 2016), shared his experience and career up until returning to the trade of carpentry; Jerònia Florit and Aina Rosa Serrano explained their work on the recovery of Mallorca’s industrial historical heritage with the Island Council; Richard Economakis presented his project of Temporary and Reusable Adoble villages in response to the current migration crisis; Carlos Martín introduced attendees from the vast world of brick and plaster vaults: Miguel Sobrino, who conveyed his passion for stonework and highlighted the values that the preservation of the trade represents for the future; Fatima Quesada showed the range of possibilities opened by her adaptation of the Andalusian ceramic mosaic tradition to the 21st century; and Scott Liddle explained about the extensive work on the recovery of traditional crafts and architecture developed by Turquoise Mountain, for the reconstruction of a degraded neighbourhood in the city of Kabul, in Afghanistan. The first session on the second day was dedicated to the relevance of Geometry in traditional construction. In it, José Miguel Merino de Cáceres showed the importance of Metrology as an auxiliary science to restore monuments; Javier de Mingo deciphered the main geometric rules of the lines used in carpentry, and Manuel Fortea explained the diverse use of geometry in the crafts of stonemasonry and masonry. The second of the sessions focused on presenting programmes aimed at promoting and preserving these trades: Donald Gray (Rafael Manzano Award 2015) and Gabriel Montero shared their experience at the School of Lebrija, Seville; Alberto Díaz presented the work and history of the Centro de Oficios León; and Simon Sadinsky spoke about the activities that take place in the United Kingdom with the Prince’s Foundation for the Building Community. To end the day, León Krier denounced the predominance of synthetic materials in contemporary architecture, which not only affect the design of modern styles, but also contribute to replacing traditional architecture with vulgar and ephemeral substitutes thereof; and Alejandro García Hermida presented the new initiatives being developed in Spain from INTBAU with thanks to the support of the Richard H. Driehaus Charitable Lead Trust in promoting traditional building and architecture. Architecture and Humanism International Seminar. 2015. A wide variety of proposals were presented that revolved around the social role of architecture, approached from different perspectives: from its responsibility when it comes to strengthening the identity of a community to the socio-economic impact of its working styles, going onto embellishing, dignifying and enriching the places where it operates. 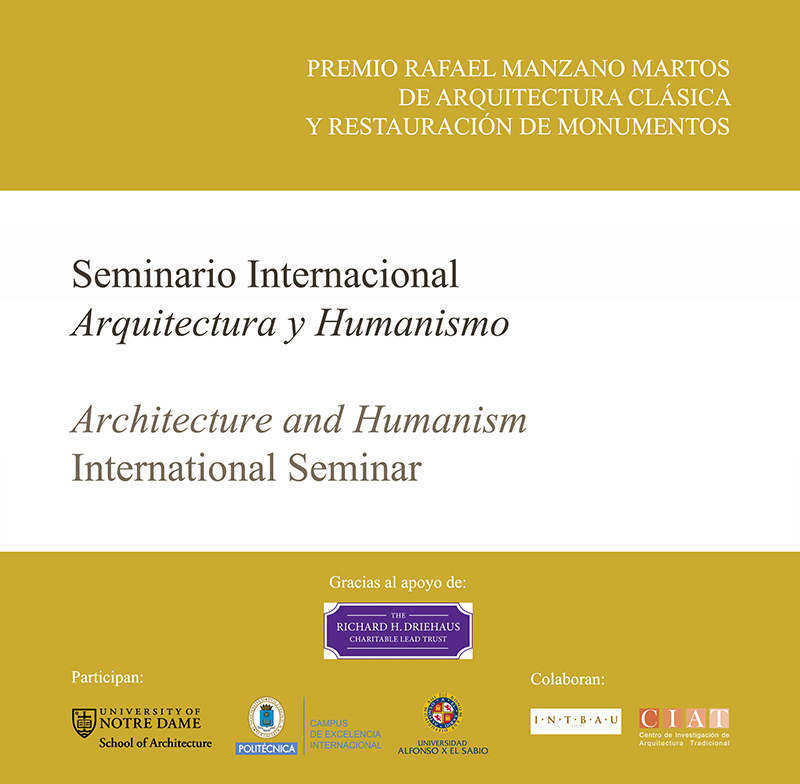 The Architecture and Humanism International Seminar was organized by the Rafael Manzano Prize for New Traditional Architecture and the Notre Dame University School of Architecture (Indiana, EEUU), with the collaboration of the Universidad Politécnica de Madrid School of Architecture, the Centro de Investigación de Arquitectura Tradicional (CIAT) and INTBAU Spain. It took place in 18-20 June 2013 in the Universidad Politécnica de Madrid School of Architecture (ETSAM). With a full room despite the intense programme, and a great audience, the seminar was a success, becoming an excellent platform for the exchange of ideas and raising interesting discussions among attendees. Architecture and Local Identity International Seminar. 2014. 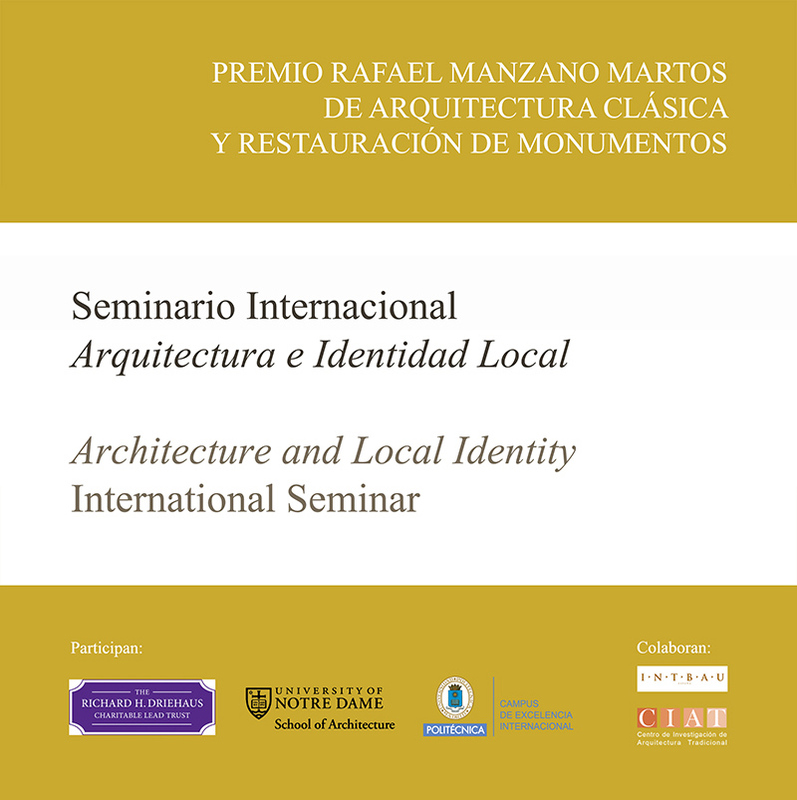 The Architecture and Local Identity International Seminar was organized by the Rafael Manzano Prize for New Traditional Architecture and the Universidad Politécnica de Madrid School of Architecture, with the collaboration of the Notre Dame University School of Architecture (Indiana, EEUU), the Centro de Investigación de Arquitectura Tradicional (CIAT) and INTBAU Spain. It took place in October 2014 in the Universidad Politécnica de Madrid School of Architecture (ETSAM). Rafael Manzano, Leopoldo Gil Cornet (Rafael Manzano Prize 2012), Luis Fernando Gómez-Stern (Rafael Manzano Prize 2013 along with Ignacio Medina), Javier Cenicacelaya (Rafael Manzano Prize 2014 along with Íñigo Saloña), Alireza Sagarchi, Pier Carlo Bontempi, Fernando Vela Cossío, José Baganha, Melissa DelVecchio, Samir Younés, Alejandro García Hermida, Julio Jesús Palomino Anguí, Salma Samar Damluji, José Luis García Grinda, Léon Krier, Maurice Culot, Jaime de Hoz Onrubia and MIchael Lykoudis participated as lecturers. It was also shown the proposal for the Plaza de la Cebada (Madrid) as a result of the work carried out in the Traditional Architecture and Urbanism International Workshop. The seminar was a success, becoming an excellent platform for the exchange of ideas and generating interesting debates among the attendees. Architecture in the Age of Austerity International Seminar. 2013. A wide variety of proposals were presented that, using traditional construction, architecture and urbanism as a reference, seek to improve the contemporary practice in these fields, making it more responsible, more sustainable and more committed to the preservation of our heritage in its broadest sense. 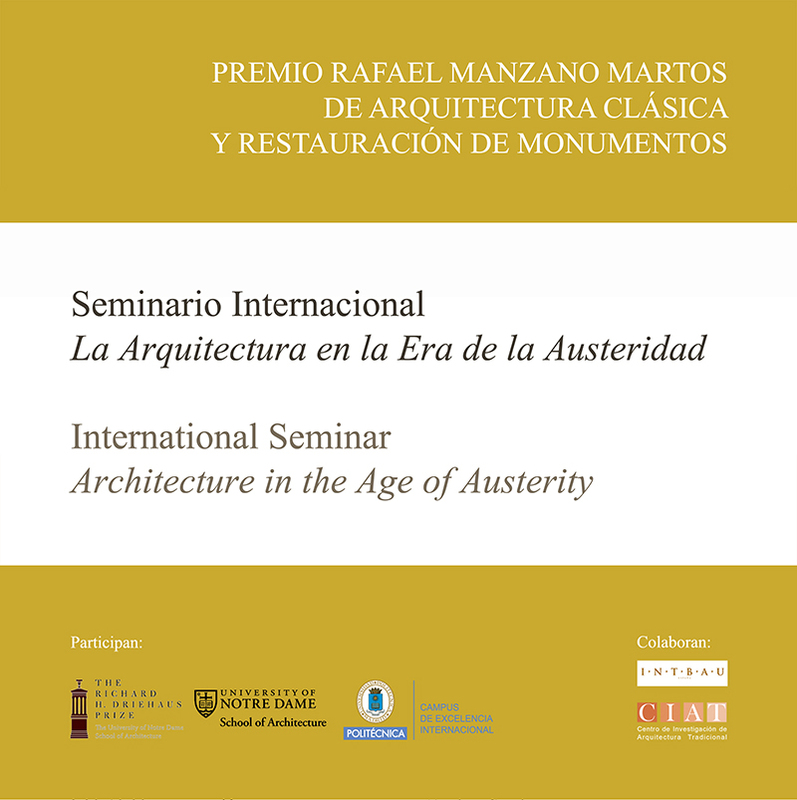 The Architecture in the Age of Austerity Seminar, organized by the Rafael Manzano Prize with the collaboration of Notre Dame University School of Architecture (Indiana, EEUU) and the Universidad Politécnica de Madrid and the support of INTBAU Spain and the Centro de Investigación de Arquitectura Tradicional (CIAT), was held on 18, 19 and 20 June 2013 at the Universidad Politécnica de Madrid School of Architecture. With a full room, despite the intensity of the program, and a magnificent audience, the seminar was a success, becoming an excellent platform for the exchange of ideas and generating interesting debates among the attendees. I Conferences of the Rafael Manzano Prize. 2012. 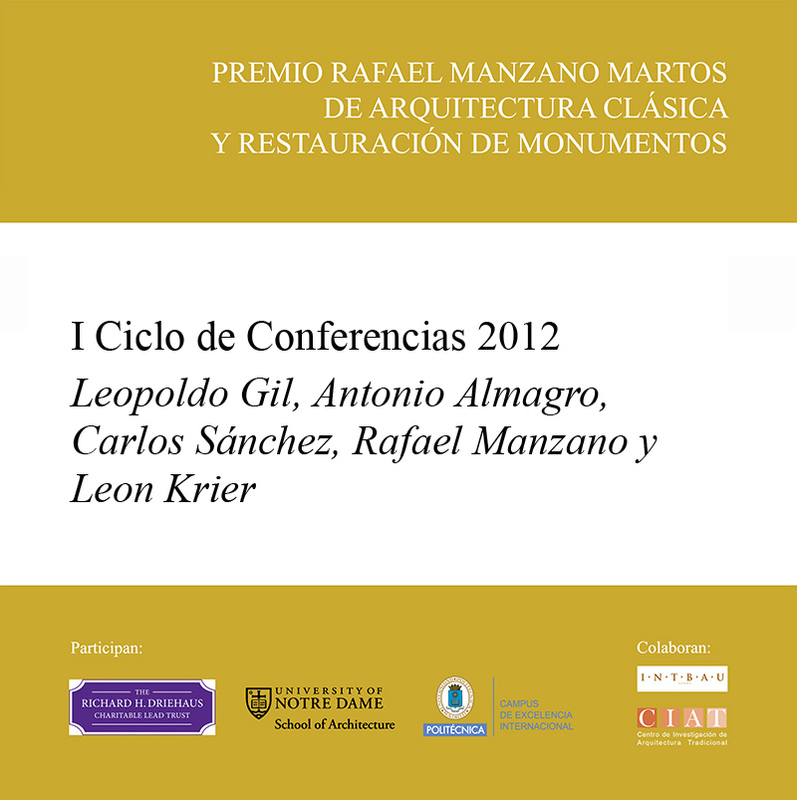 Due to the award ceremony of the Rafael Manzano Prize 2012 to Leopoldo Gil Cornet, the first Cycle of Conferences for this Prize was celebrated at the School of Architecture of the at la Universidad Politécnica de Madrid (UPM). This Cycle I of Conferences was organized by Professor Alejandro García Hermida with the support of Michael Lykoudis, director of the School of Architecture at the University of Notre Dame (Indiana, USA). It involved Leopoldo Gil, winner of the 2012 Award, Antonio Almagro, Carlos Sánchez, Rafael Manzano and Leon Krier. This cycle was possible thanks to the generosity of the Richard H. Driehaus Lead Trust and the support of the School of Architecture of la Universidad Politécnica de Madrid (UPM), and especially for its Master’s Degree in Conservation and Restoration of Architectural Heritage. 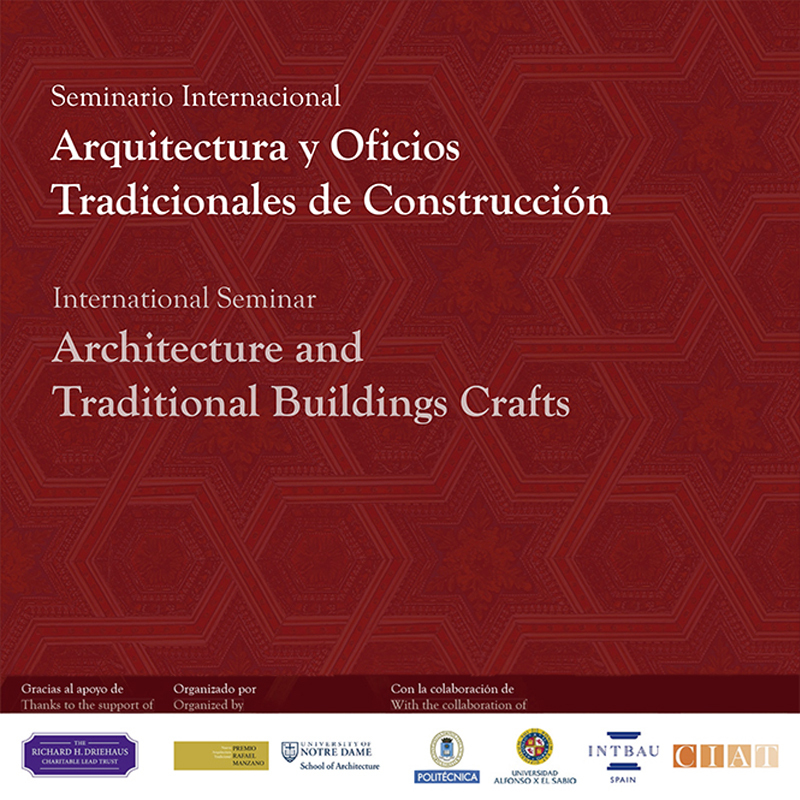 Conference: Crafts of the Traditional Architecture in Spain. 2018. 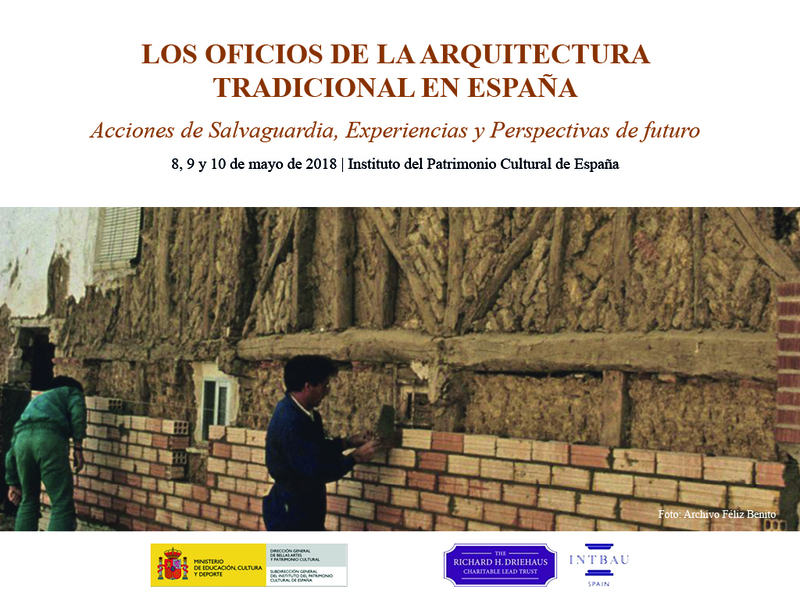 The Conferences on Crafts of Traditional Architecture in Spain: Safeguarding actions, experiences and future perspectives were held from May 8 to 10, 2018 at the Institute of Cultural Heritage of Spain (IPCE) and were organized by the IPCE itself , with the collaboration of Richard H. Driehaus Charitable Lead Trust and INTBAU. The record and digital edition of these conferences, which can be visited through the links, has been made by IAMTRECE.